Akdy is a professional manufacturer of household appliances, such as range hoods, shower heads, electric fireplaces and even bathtubs. Their customer service is exceptional, this being one of the main reasons their products sell as well as they do. They offer a warranty of at least one year on all their range hoods. Dimensions: 29.5” Width X 19.75 “ L X 42.25” H.
Voltage: 120 V / 60 Hz. This model is built for ceilings of 8-9 feet with an easy to handle telescopic chimney. For ceilings above 9 feet, you probably will need to buy a separately sold chimney extension, sold by AKDY. I only say probably, because a lot depends on the height of your cooking range and the height above the cook-top where you place the range hood. 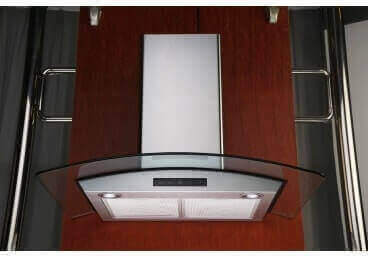 The minimum drop down height is 30.75”, this means that this is the minimum height the range hood occupies from the base to the chimney in its furthest retracted position. Check out the specification picture below for details. It’s got a 6 inch circular duct and the ventilation can either go through the wall behind the range hood or up through the ceiling. Included in this range hood is a back-draft damper which prevents warm air from escaping your home when the hood is not in use. ETL listed - compliant with the US and Canada safety standards. Thankfully for some it’s got a plug and it doesn’t have to be hardwired. You could of course strip off the plug and hardwire it if necessary. It comes with two LED lights, each with a wattage of 1.5 W.
It’s got a display 24h clock. It is durable and long lasting as it’s mostly manufactured using stainless steel. It includes two aluminum mesh filters which are easily removable and dishwasher friendly. Aluminum mesh filters are less expensive than baffle filters, but they need to be cleaned every week. It can be installed very easily, compared to some other models out there. 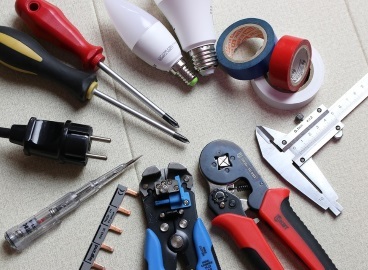 It takes the average DIY homeowner approximately three hours to setup without help. The range hood has got two screw holes at the back and it can safely be held in place with these screws. To be on the safe side, use screws which are anchored in studs. Some people have been known to drill two additional holes and use four screws, but this is not really necessary. Additional parts (chimney extensions) and replacements are easily available and are sold directly by the manufacturer. The best way to get in touch with them is through their Amazon contact page. You could also try calling them up for quicker service. It is easily convertible to ductless operation. However, you’re going to need to separately purchase carbon filters in this case. It comes with a one year limited-parts warranty. Additional warranty can be included with your purchase and we recommend you do this for all high end appliances. A quick look at it and your guests are going to be under the impression that it’s from a top brand and an expensive model. It’s probably going to be the new focal point of your kitchen. The fan blades have a Teflon coating which protects them from corrosion, thus increasing their lifespan. It’s telescopic chimney is easy to adjust and you’re not going to have problems during installation. They’ve got excellent customer support and it’s not a hassle to obtain replacement parts. A customer on Amazon has written a review saying that they replaced an aluminum mesh filter for free when her child stepped into it while it was being unpacked. The beeps are real! Many customers have complained about the loud beeps when operating the touch screen. This can be an issue at night when operating the light, etc. The hood comes with a digital clock that displays time in military format (24h format) and cannot be changed to a 12h format. Personally I don’t find this an issue, but it seems to annoy quite a few customers. Adjusting the time is simple if you know what needs to be done: Press the “clock icon” until it blinks, then use the “light icon” to set the hours and the “fan icon” to set the minutes. Why am I including this in the features I do not like section? It’s because quite a few people have stated that the clock is not accurate with it counting 58 minutes as one hour. Over the day this is a big deal. At 1.5 W each, the LED lights are not very bright, you could replace them. However, the manufacturer clearly states that you should not replace with bulbs of a higher wattage. If your kitchen is bright and you don’t depend on the light form the range hood while you cook, this is not a problem at all. At highest power (400 CFM) it generates 65 decibels which many people consider to be too loud. Regular restaurant conversations takes place at 60 decibels. Even though the presence of aluminum mesh filters helps reduce the price of this range hood, they must be washed every week. It’s not a big deal, as they are easy to remove and place into the dishwasher, but to each his own right? Customers have been complaining that some range hoods arrived with dents. This is not AKDY’s fault, but it’s something you could expect. Packing could be improved. But there were no problems getting it replaced. Nonetheless, it does cause an inconvenience, especially if you are on a schedule and have things planned out. I was looking for a range hood that looks pricey and operates well, but at the same time doesn’t poke a hole through my pocket. Customer service is important to me and I intend to use this range hood for many years. I have good lighting in my kitchen and do not depend on my range hood for lighting. I do not need an enormous amount of suction power. 400 CFM is ideal for most homes. I don't mind washing the aluminium mesh filters weekly. 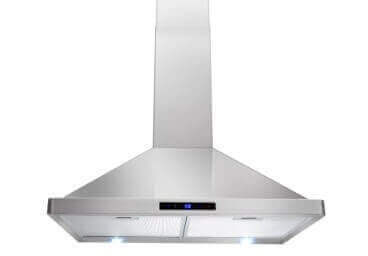 A detailed range hood buying guide that helps you pick the perfect exhaust system for YOUR home. How powerful must your range hood be? Use my free calculator to determine this based on the Home Ventillation Institute requirements. Always follow your specific installation manual, but for some general tips and directions, check out this guide. Perfect for through the wall or through the ceiling ducting, can also be ductless. 400 CFM motor which is ideal for most homes. It's easy to install and comes with a backdraft damper. Also around 400 CFM, KBC offers some of the best customer support. This model is convertible (ducted and ductless). It operates at 3 speeds and has LED lights on the front. 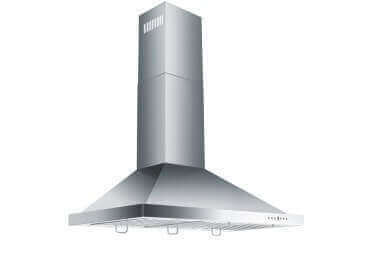 Very powerful at 760 CFM, this range hood comes with an auto shut-off feature and a 4 speed fan. It's got touch controls, but Halogen bulbs. 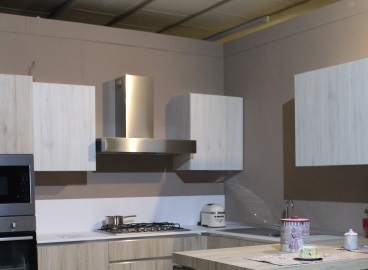 Still not sure if you found the ideal hood for your kitchen? I've reviewed a few other popular choices which you may want to check out. © Kitease. All rights reserved. Brandon through www.kitease.com is a participant in the Amazon Services LLC Associates Program, an affiliate advertising program designed to provide a means for sites to earn advertising fees by advertising and linking to amazon.com. All reviews on this website are unbiased and thoroughly researched. 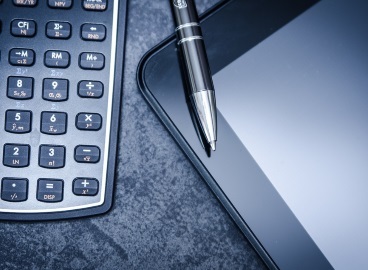 However, no claims to have ever owned and tested the products are being made, unless otherwise explicitly mentioned. 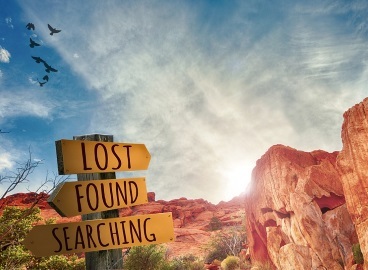 It is recommended that you do your own research before buying a product. Our goal is to help you with your research.